“We feel like we’ve been getting good care so far from Portland’s Doernbecher’s Children’s Hospital. 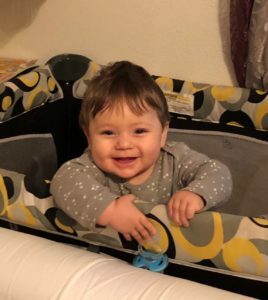 They have an excellent children’s phlebotomist who has been getting Matthew’s blood on the first try each time, and the neurologist seems very familiar with the type of genetic disorder that they’re considering as a diagnosis. The diagnostic process takes some time and a series of imaging. 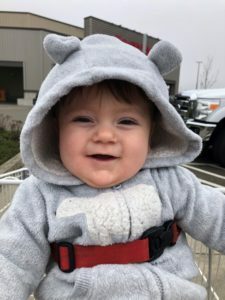 Fortunately, our new neurologist recommended no sedation for baby both due to his history of troubles with it, and the incompatibility with the condition that they feel he may be dealing with. The “recent months” they refer to started in August of last year. The first stop in this long journey was Quito, Ecuador. Then they were referred to a children’s hospital in Houston, Texas, where they spent about three months. Then they moved out to Oregon where they are currently stationed. EFM is committed to taking care of its missionaries and has some basic policies in place to help guide us in times of extended illness. We are giving the Badgley family paid time off while they pursue a diagnosis for Matthew. It is taking longer than anyone imagined to get the diagnosis. We are hoping and praying that one will be identified in the next three to five months (if the Lord doesn’t heal him first!). As you can imagine, it is taking most of Russ and Sarah’s time and energy just to make and keep medical appointments and take care of the family. The Badgleys are located just south of Roseburg, Oregon, where they were when Sarah was recovering from her illness a couple of years ago. This is the area that Russ is from. The children are currently enrolled in school. Steps are being taken to make sure the family is cared for by a network of supporters both near and far. Their friends in Ecuador continue to be as supportive as they can be and we have all been very grateful for their help in many practical matters. Both Badgleys and EFM are grateful to you for standing with them in prayer and also through your ongoing financial support. We will do what we can to keep you updated as this journey continues.